With an “intensified” greenhouse effect, we should see a decrease in out-going long-wave infrared radiation into space. We should see warming of the atmosphere (the troposphere), a “hot spot” especially over the tropics. We should see more down-welling infrared radiation that further warms the surface. That’s the essence of the anthropogenic global warming (AGW) hypothesis. But, real-world measurements show we are seeing none of those effects. Balloon-borne radiosondes and two separate satellite systems measure the temperature of the troposphere. None of these systems detect the model-predicted warming spot in the troposphere. [Source: Douglass, D.H. et al. 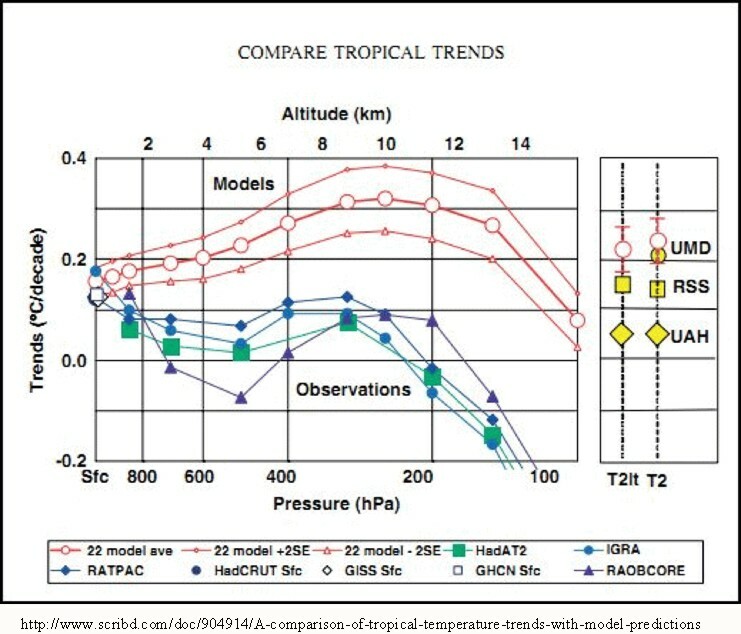 2007, A comparison of tropical temperature trends with model predictions, International Journal of Climatology DOI:10.1002/joc.1651]. There is one more failed AGW prediction: CO2 is supposed to start warming which evaporates water, a stronger greenhouse gas that will enhance warming. 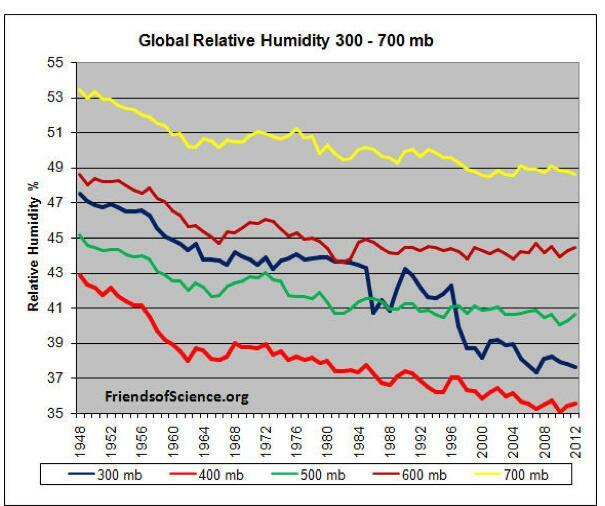 That should increase global humidity, but measurements show that global humidity is not increasing. Empirical data show that the AGW hypothesis fails on four major predictions. This indicates that our carbon dioxide emissions have little to no effect on global temperature nor the intensity of the “greenhouse effect” possibly because the AGW hypothesis ignores convective heat transfer (weather) and other natural cycles that control the complex climate system. Feynmann’s admonition is demonstrated by comparing global atmospheric temperatures predicted by models (based on their false assumptions) with real world observations. The objective of this research was to determine whether or not a straightforward application of the “proper mathematical methods” would support EPA’s basic claim that CO2 is a pollutant. These analysis results would appear to leave very, very little doubt but that EPA’s claim of a Tropical Hot Spot (THS), caused by rising atmospheric CO2 levels, simply does not exist in the real world. Also critically important, this analysis failed to find that the steadily rising Atmospheric CO2 Concentrations have had a statistically significant impact on any of the 14 temperature data sets that were analyzed. The temperature data measurements that were analyzed were taken by many different entities using balloons, satellites, buoys and various land based techniques. Needless to say, if regardless of data source, the structural analysis results are the same, the analysis findings should be considered highly credible. Thus, the analysis results invalidate each of the Three Lines of Evidence in its CO2 Endangerment Finding. Once EPA’s THS assumption is invalidated, it is obvious why the climate models EPA claims can be relied upon for policy analysis purposes, are also invalid. And, these results clearly demonstrate—14 separate and distinct times in fact–that once just the Natural Factor impacts on temperature data are accounted for, there is no “record setting” warming to be concerned about. In fact, there is no Natural Factor Adjusted Warming at all. Moreover, over the time period analyzed, these natural factors have involved historically quite normal solar, volcanic and ENSO activity. At this point, there is no statistically valid proof that past increases in atmospheric CO2 concentrations have caused the officially reported rising, even claimed record setting temperatures. According to temperature change observations in the satellite era (December, 1978, to present), this pattern did not occur. 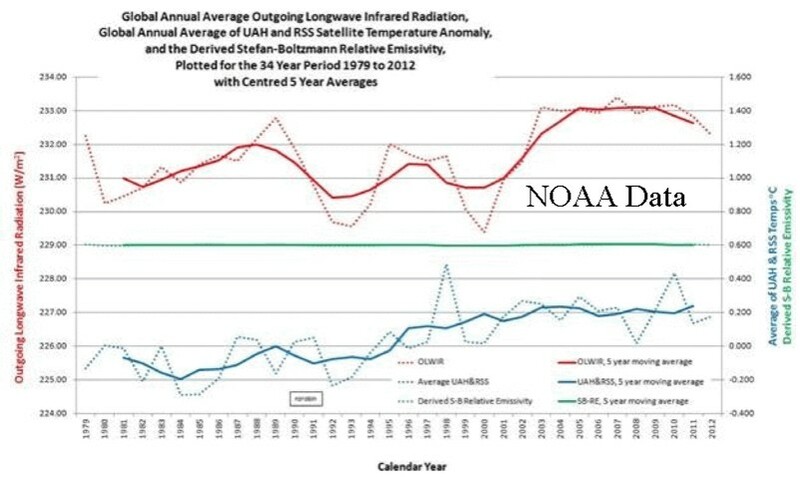 According to AGW models, there was supposed to be an evident intrinsic relationship between lower stratospheric temperatures and tropospheric temperatures in accordance with the explosive increase in anthropogenic CO2 emissions during 1978-2018. Satellite observations do not indicate that such a stratospheric-tropospheric relationship existed during this period. The fundamental discrepancies between AGW models and real-world observations led these climate scientists to conclude that (a) “climate models are not able to simulate real climate”, and (b) the view that increases in greenhouse gases from human activities are what caused the global warming over the last 40 years cannot be reliably supported by observed evidence. Thanks for continuing to post to your blog. This is a great example of real world data not matching up with models. But I think your final interpretation makes the same mistake as both AGW supporters and refuters (I don’t know what the name of the moment is for the two sides). The point of the post is to show that current models don’t indicate anything. They don’t match up with real world data so they are wrong. AGW supporters can’t say that the models prove anything because they don’t. Likewise AGW refuters can’t say the models’ inability to prove AGW is itself proof of anything. It’s not. The models are wrong, so the current AGW hypothesis is wrong (it has to be, or it would match up with real data). But to say that CO2 emissions have no effect is not shown to be true by the incorrectness of the AGW hypothesis. It’s not a binary question. Your point is well-taken. Disproving one thing does not necessarily prove another. I will point out, however, that the IPCC etc. have failed to come up with any physical evidence showing that CO2 has a significant effect on global temperature. The absence of evidence is suggestive.